The Rancor Pit :: View topic - Let's do Star Wars comic books! Let's do Star Wars comic books! Posted: Mon Dec 08, 2014 9:53 pm Post subject: Let's do Star Wars comic books! As the Star Wars comic book license in on the verge of returning to Marvel, let's hear about your experience with Star Wars comics. Did you read them when you were a kid? Have you read them since? Do you read them now? Do you maintain a collection? Let's hear about it! Funny, when you got to video games I considered starting up my own thread for the comics. Strangely, though I'm a huge fan of comic books AND a huge Star Wars fan, I'm not so keen on most of the stuff that's been put out for them. I was an avid collector of all the early issues (Marvel did after the first movie), though even as a kid I thought they were goofy and overall pretty bad. I still think back to that early story (I think it was the first Annual) where they had a backstory with three characters running around: a young Obi-Wan Kenobi, a young Skywalker (Luke's father), and a young Darth Vader (back when he was a Jedi). Over the years I've collected scattered story arcs or collections. I got the Heir to the Empire series as well as Shadows of the Empire. But I've held off on getting much of anything in the Dark Horse pantheon, as there was so much (and comics are so expensive nowadays). The new Marvel stuff does look intriguing! They've got some great writers and artists on board, so things look promising! Another great thread. I loved Marvel comics as a kid (more than DC), so you'd think I'd have been the perfect target. I LOOOOOOVED the SW comic adaptation, I think my grandma bought me the "king-size edition" that compiled all the movie adaptation issues. I read that thing... more times than Whill saw the movie! Then I took one look at that stupid rabbit and ignored the SW comic forever. I never even bothered with the ESB/ROTJ adaptations when they came around (although I did read the novelizations many times each). Then I came across some of the Dark Horse compilations in a used book store, and I picked them up on a lark. Now thinking of them more as sword-and-planet adventure stories in the SW universe, I read through them and enjoyed enough to pick up the other compilations of the Marvel comic to its bitter end. So, I've come to appreciate them and am less of a puritan when it comes to genre-mixing as I was as a kid. I have very few Stat Wars comics, Tales of the Jedi Fredon Nadd Uprising two issue series, which I liked. The Dark Empire wasn't bad but the best parts were the Sea Commandos, World Devastators, and the best part is the two ewok heavy weapons crew. The best Star Wars comic is Bungo n' Rusti Get Carry-Out, in Adventure Eleven. 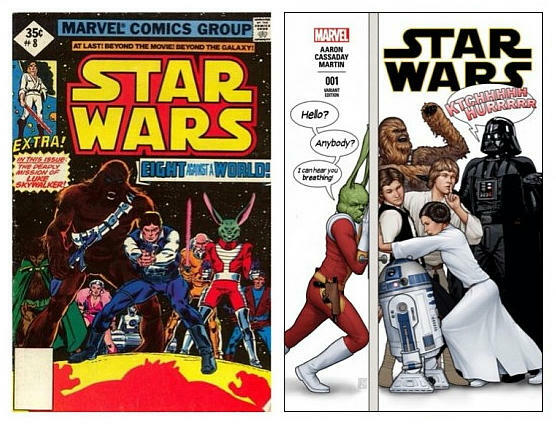 The first six issues of Marvel's original Star Wars comic series was the adaptation of the movie. The same childhood friend that got me into D&D had that which I read, but I can't remember if he had the individual issues or a compilation. I vaguely remember standing at the comic book display in my family's local grocery store reading the one with the story of Vader and Luke's father (as two separate characters). I only ever owned a few issues of the series and I can't remember what happened to any of them. When I started collecting comics a few years later I either no longer had them or got rid of them because they were just odd single issues and the artwork was pretty poor. The only one of those I even halfway remember is the issue pictured below, because I read that the first time I ever flew in a plane (which of course my brother and I pretended was the Millenium Falcon). Anyway, I now have a small collection of Dark Horse Star Wars comics that are all in good condition, bagged and boarded in a comic box with some other comics. They are presented here in roughly chronological order. I collected and read the original six-issue Dark Empire series (and even bought two copies of #1) despite hating it after the first issue. I sold the series a few years ago but kept the extra unread issue of #1, but now I can't find that so I must have gotten rid of that later. I'm definitely going to buy the new Marvel Star Wars #1 next month, but it's going to have to be pretty good for me to continue collecting it after that. Despite the bad artwork and wacky stories, I'm actually feeling somewhat nostalgic for the original Marvel series so I am interested in getting reprints of the classic trilogy movie adaptations (not the whole series), but from what I've seen so far they are all so expensive. So maybe Marvel will issue new reprints of just the film adaptations I can pick up (even a compilation of all three in one book would be great). Thanks, Whill. I definitely appreciated that cover. For me- I didn't discover them 'till my teenage years*, when the library got in the omnibuses- but I fell in love with them then. Not much more to my discovery of them- just a straight read-through from start to finish. I do re-read them at times (and, as in my sig, adapted a number of them into an audio drama). I think, for me, even though they can be hokey and far-out, they capture the 'tone' of Star Wars (as expanded upon in the Rebels thread) perfectly (yes, even Jaxxon). Not the eventual style or continuity... but the feel of those original movies. And yes, I do keep a collection- complete, though made of patchworks from different omnibus releases. I also really dug Ewoks: Shadows of Endor (which was a fun little continuity tie-together of all the different Ewoks media to celebrate/close out their Legends run), the ANH Infinites comic, Quinlan Vos' ongoing storyline, and the KOTOR series with Zayne Carrick (which is probably my second-favorite SW comic after the Marvel stuff). I haven't got into Legacy as much as I'd like to, but I enjoy it, too. *Actually, in my childhood, my uncle had an issue from late in the run (I think the Iskalon Effect or Tidal). The striking image of a mysterious figure with a sword slashing Luke's air tank struck with me, but without a context for the story, I never pursued or understood it until I started the entire read-through years later. The Moon Swing Chronicles is an old-school SW-RPG website (been around since the mid-to-late '90's). It has character stats and alien species templates for a lot of the material covered in the Marvel Comics. Check it out. 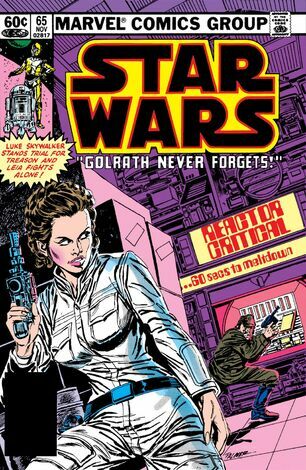 I've read and collected many of the comic series over the years, but the one issue I always think of fondly is one of the first I got, Marvel Comics Star Wars #65 "Golrath Never Forgets". Growing up, I was always enraptured by Princess Leia's beauty, but this story really showcased her physical prowess and ingenuity as a warrior. Tom Palmer's art also impressed me as a kid, really capturing the look of the films that comics published before The Empire Strikes Back didn't. In fact, that's one of my biggest draws to some of my favorite comics: do they look like the movies. Sure, I don't mind funky stories and artists interpretations (esp. Carmine Infantino's run), but when it looks like the movies, my inner child is very happy. For example, the comic adaptation of Splinter of the Mind's Eye was so much eye candy that I can forgive some of the quirks of the original novel. My favorite series outside the original trilogy has be Knights of the Old Republic. I really enjoyed Zayne, Jareal, Marn, and the rest of the crew. The art was pretty good, and the stories were just great. The Star Wars #0-8 (the 2013-14 mini-series adapting the first screenplay draft for Star Wars, 1974. I just finished reading this series and it's great! The artwork is very good, and it was fascinating to read a graphic representation of the 74 rough draft script. The story was not only the springboard for the original Star Wars film (ANH), but aspects of the two sequels and even the TPM also come from this story. The alternate universe that this story takes place in would be a worthy component of my personal Star Wars multiverse. Despite spending $32.32 total plus tax to collect the 9 issues of the series, I am tempted to use an Amazon gift card to buy the hardback compilation for only $17.99. That does sound intriguing! It looks like Amazon has paperback compilation right now for about $15 and the hardback for just under $30. I might have to snag it in paperback. Thanks for the heads up, Whill! Oops, yeah you're right. I had mixed up the paperback with the hardback. But yeah, the paperback did come down a little, but I'll still probably buy the hardback to put on my bookshelf with my other SW books (instead of in the comic book box like the comics). I only ever read the Dark Horse graffic novels, I didn't get into comics until the early 1990s, and it only lasted a few years as $$ got tight as the first kid showed up in 1996. I would love to see Marvel start printing Star Wars comics again, mostly for my boys who devour whatever Star Wars comics they can get from the library! I'm definitely going to buy the new Marvel Star Wars #1 next month, but it's going to have to be pretty good for me to continue collecting it after that. Vader unexpectedly shows up on a Imperial moon base where Luke, Leia, Han, Chewie, Artoo and Threepio are on a Rebel mission. However it ends with a cliffhanger with Luke separated from the group and encountering Vader in a hallway. I don't think it will be revealed to be a vision or dream because Obi-Wan's voice shows up right beforehand urging Luke to run away. So as soon as they flush the original Marvel SW comic series and Splinter of the Mind's Eye from canon, the first thing they do is substitute those for another pre-TESB Vader-Luke encounter? WTH? The continuity from publishing should only support and expand upon the films. IMO, TESB is more dramatic and meaningful if that is the very first time Luke confronts Vader in person. And the story canon group is being vague about timeline placement with these new comics and novels taking place in between ANH and TESB. This time period was always a chaotic continuity cesspool in the EU, and now they seem to be making all the same mistakes of the EU when this is their chance to do things right this time. Ugh.